WAILUKU, HI – February 22, 2017: The Maui Red Cross was the most recent beneficiary of the Ohana Fuels’ ‘Fuel up. Do Good.’ program. 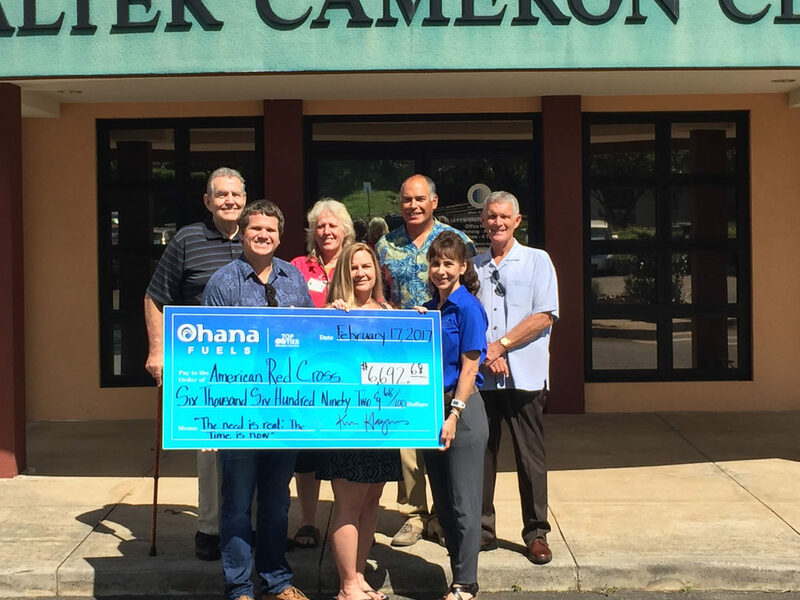 Ohana Fuels partners with nonprofit organizations that serve the needs of local communities by donating a portion of every gallon of gasoline and diesel purchased at Ohana Fuels stations in that community. For the fourth quarter 2016 a total of $6,692.68 was donated to the Maui Red Cross. Back Row – Left to Right: Ron Vaught, RC Adv Council. Merry Tamashiro, RC Volunteer. Kimo Haynes, President, Hawaii Petroleum. Roger Dixon, RC Adv Council. Front Row – Left to Right: Chad Goodfellow, RC Adv Council Chair. Michele Liberty, Red Cross Maui County director. Laura Alfonso, Hawaii Petroleum Marketing Representative. Funds raised from this program will support Maui disaster preparedness and response which includes assisting disaster victims with immediate emergency needs such as food, clothing, shelter. In addition, the donation will aid the organziation in conducting its vital community disaster education outreach programs Last year the Maui Red Cross taught disaster preparedness to 293 keiki through “Pillowcase Project Presentations”. In Maui County, the Red Cross works tirelessly to prevent tragedies from happening, as well as to lend help when disaster does strike. Last fiscal year, the organization installed 78 smoke alarms making 28 homes safer. The Red Cross on Maui also responded to twelve home fires, helping 39displaced family members get back on their feet and start rebuilding their lives after tragedy struck. They also twice opened shelters for residents who were evacuated or unable to return to their residences due to brush fires. About Ohana Fuels:Ohana Fuels is Hawaii Petroleum’s retail fuel brand that provides competitively priced, quality fuels at safe, clean, and convenient locations including eight stations on the island of Maui, and eight stations on the island of Hawaii. Certified as a TOP TIER™ fuel provider, Ohana Fuels meets the premier standard of gasoline for optimum performance and fuel efficiency. Hawaii Petroleum is committed to making a positive contribution to the communities in which our Ohana Fuels stations operate, and gives local residents a way to support the community with every tank of gas they purchase. Learn more at www.ohanafuels.com.